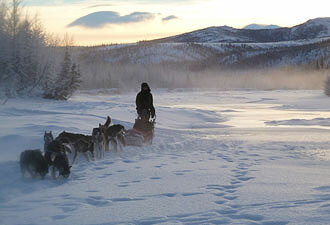 Only in Denali: Rangers patrol the park by dogsled. Check out the size of those feet! 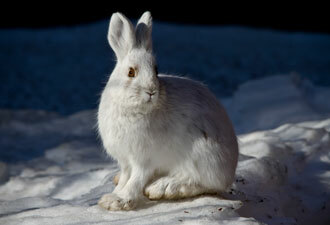 Snowshoe hare are well-adapted for year-round life in Denali. You wouldn't believe how many times I've heard that said. Most visitors only experience the park during summer, and they are very curious about Denali in winter. They've heard it's cold and that the days are short. While both are true, my winter experiences in Denali have been unforgettable. I'm happy I didn't rule out a trip to Denali in the winter, and I hope you won't either. The Denali landscape, cloaked in a sparkling blanket of snow, is a sight of wonder. Winds picking up the snow and swirling it, mid-air, remind us of the forces that shape the landscape itself. We think nothing happens during the winter, but that is so wrong. While grizzly bears and arctic ground squirrels hibernate, other animals, including caribou, Dall sheep, and moose are constantly on the move searching for food and evading predators. Unlike these inhabitants of Denali, I'm not originally from Alaska. And like many visitors, my first visit to Denali National Park and Preserve was during summer. The vast, open landscapes, mountains rising up on every horizon, moose that seem to appear out of nowhere, and endless carpets of wild blueberries were permanently emblazoned in my mind. Fast forward a few years. 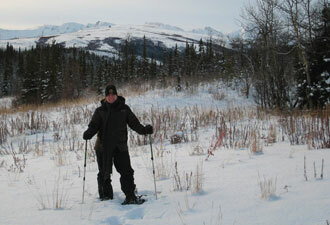 In November of 2010 I returned to Denali — just as winter was getting underway. Despite apprehension about dealing with the difficulties of winter, I came to fulfill a dream — to experience more of what this amazing state has to offer the intrepid visitor. The land has a beauty all its own in winter, thanks to a factor that most people are curious about: light. The darkest — and coldest — time of year occurs in December and January. During these months, Denali employees commute to and from work in the dark. On the winter solstice, the shortest day of the year, Denali sees little more than four hours of daylight. On the days surrounding the solstice, the sun is so low in the sky that the peaks of the Alaska mountain range actually block it from view at park headquarters. The sky glows, but people in the park might not see the light source. The angle of the light makes for beautiful pink hues on the snow-covered peaks at dawn and dusk. In the heart of the winter, another ‘light’ source fascinates Denali's residents and visitors alike: the aurora borealis, or northern lights. They are best seen on clear nights between about 10 pm and 2 am. Don't be afraid to set your alarm, get dressed in warm layers in the middle of the night, and go outside to view this amazing phenomenon! The park offers endless opportunities for cross-country skiing, snowshoeing, skijoring, and dog mushing. If you don't have your own equipment, you are welcome to borrow snowshoes and trekking poles at the Murie Science and Learning Center, which also serves as the winter visitor center. Open from 9 am to 4 pm daily, except major holidays, the center offers information, exhibits, restrooms, screenings of the park’s award-winning film, Heartbeats of Denali, and a cozy fireplace to warm yourself after your winter adventure. Primitive winter camping is available for free in the Riley Creek Campground. After the solstice, days start lengthening. By February and March, Denali warms up a bit and visitors are less likely to face long stretches of bitter cold. Visitor numbers begin to increase along with the temperatures and day length. Clear, beautiful days in March afford excellent opportunities to enjoy the great trails packed down by rangers as they patrol the park by dogsled. A winter visit to Denali's kennels offers an exciting glimpse into this beloved park tradition; visitors can meet the dogs and get a first-hand look at the equipment that rangers use during winter patrols. On February 24-26, 2012, Denali will celebrate the park's long winter during the 12th annual Winterfest, a community-wide event embracing all that's fun about winter. Among planned offerings this year are free dog sled rides, ranger-led snowshoe hikes, snow sculpting, activities for children, and a full schedule of evening events. Denali is well-known for its summer scenery and wildlife-viewing opportunities, but winter makes up a larger than average portion of the year in interior Alaska. The ability to not only survive, but to thrive in a difficult environment is what makes denizens of this land, wildlife and humans, special. Experiencing Denali during the winter has provided me with a deeper understanding and appreciation of this place, and it may well do the same for you. Don't let winter hold you back. Come to Denali. Experience the light.